You’re lips never looked this great or healthier as this. This custom lime lip shimmer w/white tube cap is considered a great cosmetic lip healer because eases over dry cracked or irritated lips and imparts healthy looking texture. This lip shimmer tastes like juicy and freshly squeezed lime cooler, and it is one of the most favored choices during summer. Health Quotient –Lime flavor. Saccharin included. Synthetic or debilitating colorings, flavorings, smell or taste enhancers avoided. FDA approved moisturizing agents used in formulation. PABA free. Cruelty- free. Directions – Rub lime lip balm over lips during harsh summers. Complement it with your lipstick or lip shimmer for an added effect. Avoid rubbing it as a moisturizer over face. 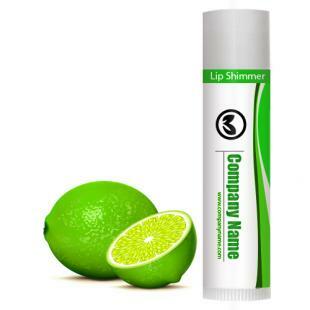 Gifting Favors – Custom lime lip shimmer are largely offered for summer gifting. It makes a very eligible greeting token during beach side parties, beach festivals, summer weddings, pool parties, etc. Product Color – White. Imprint area - 1.75"x1.25". Imprint Area : 1.75" x 1.25"